Earlier this week a seven-day strike by Fairfax journalists came to an end. In the interim it was made apparent what Fairfax publications would look like sans most of the talent: wisp-thin, with double-page spreads of Australian Associated Press wires and, bizarrely, an opinion section in large part syndicated from The Conversation, whose pieces are published under a Creative Commons license. While Fairfax's domestic coverage floundered, its foreign coverage was of its usual high standard, and on some days grew to subsume the front page (Fairfax's foreign correspondents are on contracts, and are considered exempt from strikes). But while strike action may raise the relative prominence of Fairfax's foreign coverage, the prospective cuts themselves are only a further risk. A diabolical combination of Fairfax in strife, fake news and consternation over the amount of advertising revenue going towards the Facebook-Google duopoly has prompted Australia's most media-savvy senators to establish a Select Committee on the Future of Public Interest Journalism. The committee will explore the state of public interest journalism, what if anything government can do to help, fake news, and a number of other issues. Its report is due in December. Australia is struggling to balance shifting global dynamics. We are not on top of some of the key global shifts that are affecting our place in the world, such as the rise of misinformation, cyber politics and Russian's increasing influence. We have no idea what US President Trump is going to do, say or tweet tomorrow. We are still learning about the type of great power China is becoming. But while Australia's mastheads would undoubtedly prefer to not be outdone by the Zimbabwe Broadcasting Corporation, at this point it might be an unaffordable luxury. There is no certain path for transitioning Australia's traditional media outlets to digital-driven profitability. Advertising revenue has been hewn off by juggernauts Google and Facebook, the new distribution arms of legacy media, who can target advertisements far more effectively than Fairfax or News Corp could ever hope to. 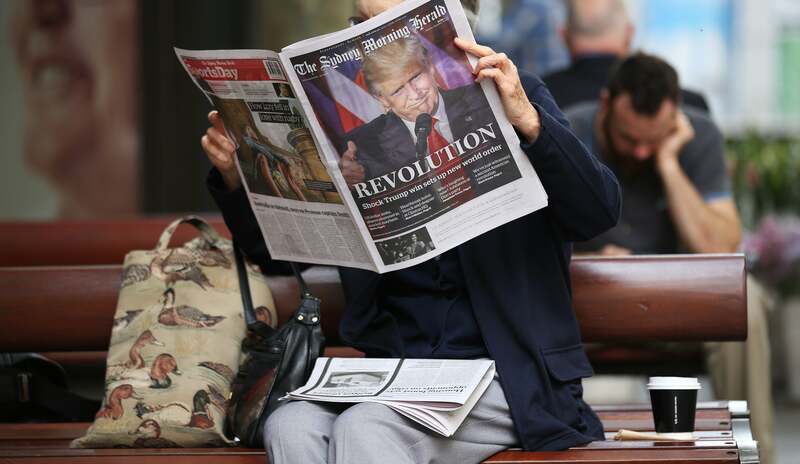 Last year The Australian's former editor Chris Mitchell argued that the future of media profitability is digital consumer revenue, pointing to the successful experiences of the Wall Street Journal and the Times of London. But breaking the decades of conditioning that has led Australian consumers to expect high quality reporting free of charge is a tall order. Paywalled articles are flagrantly ripped off without any consequence. As of March, two of the ten most popular news websites in the country are public broadcasters*, while another is a trust fund-fuelled multinational. Less prominent are a smorgasbord of freely accessible blogs, publications and magazines run in people's spare time, or by universities or non-profits (The Interpreter falls into this latter category). Moreover, an emphasis on digital subscriptions would run counter to Fairfax's current 'clickbait' approach in particular – rebuilding its online brand will take time the outlet may not have. But within the broad category of public interest journalism emphasised by the Select Committee, one can draw a somewhat awkward distinction. Well-resourced Australian journalism is undoubtedly necessary as a means of informing the public about domestic issues (after all, who else is going to do it? ), but are well-resourced Australian foreign correspondents necessary in the same way, when international media from some areas of the world is so readily accessible? It's great to have Australian reporters in the US, for example, but it's hard to argue that the Australian public truly needs those boots on the ground to explain a particular aspect of the Trump phenomenon in a way that a combination of US media outlets and Australia-based reporters would be unable to. But unfortunately it's this kind of foreign coverage that makes the most commercial sense, and can come at the direct expense of reporters in other, less fashionable areas of the world. When faced with a direct choice between profitability and public interest, commercial outlets will always choose the former – there are now no commercial Australian foreign correspondents in Papua New Guinea, a nation whose relations with Australia former Department of Foreign Affairs and Trade Secretary Peter Varghese once characterised as a 'barometer for Australian foreign policy success'. Australia's foreign correspondents are important, but it would be remiss to consider the work they each do as equally endangered, or equally necessary to furthering Australia's understanding of the world. Unfortunately, how to make reporting from India or Papua New Guinea a commercially logical venture is a question without an easy answer. *This article originally used the term 'state broadcasters'.